Namibia is the best place in Africa for journalists, says France-based Reporters Without Borders. Sitting at spot 22 on the organization’s global measurement, Namibia counts as the top African nation in its 2014 World Press Freedom Index and is closely followed by Cape Verde at number 24. Ghana is in third place at 27. All three countries beat The United Kindgom (33), France (39) and the United States at 46 in the rankings. Africa’s top ten includes Botswana at fourth place and with a overall rank of 41. South Africa (42), Niger (48), Burkina Faso (52), Comorros (53) and Maurtitania at 60 make up the list. 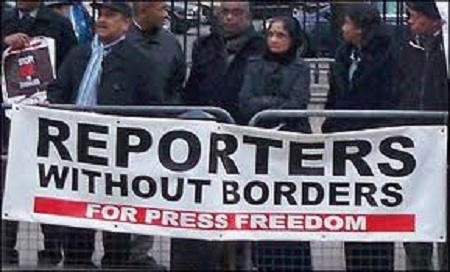 Somalia and Eritrea are among the dangerous places for journalists with the latter placed last among the 180 countries. Globally, Finland is recognized as the country most friendly to journalists. Others in the global top ten in order of importance include the Netherlands, Norway, Luxemborg, Andorra, Liechtenstein, Denmark, Iceland, New Zeland and Sweden. Reporters Without Borders notes that its index, among others, spotlights the negative impact of conflicts on freedom of information.